from the Damon Runyun story, "Little Pinks"
The Gist of it: A kind-hearted busboy, in love with a heartless singer who becomes crippled, will do anything to make her happy. The Big Street is the story of Little Pinks (Henry Fonda), a busboy and a glamorous singer and dancer named Gloria Lyons (Lucille Ball). She is a completely self-centered person with a heart made out of ice, but Pinks considers her to be the most beautiful and talented woman in the world. He's a sweet guy but, as his friend Violette (Agnes Moorehead) points out, "a terrible, terrible fool" when it comes to Gloria. He worships her from afar until one night when he finally gets to meet his dream girl. Pinks works at an establishment owned by Gloria's boyfriend, the dangerous, crime syndicate head Case Ables (Barton MacLane). One night, as Gloria was walking in to see Ables, her beloved a dog, Baby, jumps out of her arms and runs out the door. Pinks sees this and rescues the dog just before it runs into the street. In doing so, he inadvertently caused Ables to lose $25,000. Pinks was supposed to be standing by his friend, Violette, during an eating contest she was participating in. She needed him there for moral support. Ables had money riding on Violette to win. When Pinks left her side to rescue the dog, she stopped eating and lost the contest. Infuriated, Ables knocks Pinks out and fires him. Gloria saw the whole incident and steps out of character by doing him a good turn- She gets him a job bussing tables at the nightclub she appears at. Pinks is delighted to work in such close proximity to Gloria. He even begins calling her �Your Highness�. One night during Gloria�s performance she catches the eye of a handsome young millionaire named Decatur Reed (William T. Orr). Decatur�s much younger and better looking than her brutish boyfriend, Case Ables, so she responds to his interest in her by making a date with him. Ables is not one to be trifled with. When Gloria tells him they�re through he strikes her, and the blow causes her to fall down a mean flight of stairs. Ables, of course, feels no remorse, so Pinks takes on the task of helping her through her upcoming recovery period. Her hospital bills are astronomical. When her own money runs out, Pinks scrimps, saves and borrows to continue paying her bills and keeping her in the best room in the hospital. Then he begins sending her roses to keep her spirits up and make her think she has a lot of friends hoping for her swift recovery. He even allows Gloria to believe it's Decatur Reed helping her out and sending gifts. In reality Decatur now considers Gloria to be "damaged goods" and has avoided her like the plague ever since the accident. Gloria expects to �convalesce at his estate� when she gets out of the hospital, until the day she realizes she is paralyzed from the waist down. Pinks convinces her to stay with him until she gets well. To make her feel better he tells her the doctors say she will be able to walk again very soon. In reality they say she'll never walk again. Gloria is perhaps the most ungrateful person in the world. Pinks is a busboy, he has barely enough money to take care of himself. He bends over backwards to make her comfortable, but this is not enough to win her respect. She screams at him and complains about everything, particularly the temperature in his apartment. It�s winter in New York and she�s cold, so she tells Pinks it will be impossible for her to recover unless she gets to a warmer climate- to Florida. Pinks can�t afford to even pay for a bus ticket to Florida. So, if you can imagine, Gloria asks him to push her in her wheelchair from New York City to Miami Beach. Pinks has a lot of friends and they try to earn money for the two to make it to Florida by some other means of transportation but it doesn�t pan out. He and Gloria begin their cross-country journey, Gloria in her wheelchair, Pinks pushing. They hitch a ride here and there and eventually do make it to sunny Miami Beach. But the Florida sun does nothing in the way of warming Gloria�s heart. She continues bossing Pinks around, treating him like garbage, and Pinks continues treating �Her Highness� like a queen, and telling her she�ll be on her feet in no time. Soon after their arrival, her spirits are further lifted when she has a chance meeting with Decatur Reed. Gloria was reclining on a beach chair at the time so he doesn�t realize she's still unable to walk. He makes a play for her again, but she can't hide the truth very long. Decatur finds out she�s paralyzed, and quickly forgets about her again. She sinks into a deep depression, finally realizing that she�ll never be her old self again. Her health deteriorates quickly. Her doctor tells Pinks that Gloria�s health will continue to fail and she could die. The problem is, ever since she began her recovery she was living with this grand illusion. She thought the paralyzed state she was in was only temporary. She was counting on a swift recovery after which her life would return to normal- and she could pick up where she left off with Decatur. The illusion was shattered when Decatur shunned her. The doctor tells Pinks that the only way to restore her health will be to restore the illusion. Pinks knows just how to do this. Gloria had told him all about what she envisioned. She saw her self in a grand ballroom, with Decatur there and �alotta classy people�, and she�s wearing a beautiful white gown covered in diamonds. Everyone�s fawning over her and all the men are clamoring to dance with her. It sounds like a fairytale to everyone but Pinks. He loves her so much he�ll do anything to make her dream come true. Slowly he gathers all the ingredients for the event. He finds a woman wearing a dress just like the one Gloria had described. He goes to the woman�s house in the night and steals it. Then he gets the ballroom for the event from Gloria�s ex-boyfriend- and the cause of her accident- Case Ables. Pinks gets the club, food, champagne, decorations and invitations for the party all by blackmailing Ables. To get everyone to come, Pinks� many friends, such as Violette, Nicely Nicely (Eugene Pallette) and Horsethief (Sam Levene) spread the word that �Her Highness� (who Pinks named as the guest of honor on the invitations) is �the Princess of Corolia�. Now there�s just one more ingredient, the most important of all, Decatur. Nicely Nicely and Horsetheif get the job of �persuading� him to attend. Finally, the big night arrives. Everything is perfect. By this time, Gloria�s personality has undergone a makeover. Although she doesn't know exactly how Pinks put everything together, she couldn�t be happier or more grateful, especially when Decatur Reed comes over and talks to her (Unbeknownst to her he is being muscled into it!). Gloria even gets to sing a song she made famous during her hey day, �Who Knows�. People start walking out when they see it isn�t �The Princess of Corolia�, but once again, Pinks' friends are there to keep everyone in line. Among the guests is the husband of the woman Pinks stole the dress from. He sees Gloria wearing his wife's gown and jewels and is about to have her arrested - until he finds out something Pinks overheard when he was stealing the dress: his wife is having an affair. Upon hearing this, the man wants to do everything he can to help. He tells his wife and her friends to go make a fuss over Gloria. Then finally, Decatur's final task of the evening is to hand over his tux to Pinks so he can join the party and stop serving the guests. Nicely Nicely lets the truth slip to Gloria about how Pinks got the dress and jewelry she's wearing, so she finally gets the full scope of everything Pinks had to go through to put together the event. When Pinks comes out in Decatur�s tux and joins the party, a grateful Gloria has another wish- that she could dance with him to the music at her party. Pinks holds her up as he glides her across the dance floor. Gloria tells him, �I�m happy now, Pinks. I�m happy for the first time in my life.� But she has one last wish- then she �wouldn�t mind never walking again�- she wants to walk up the stairs to the balcony with Pinks and watch the sunrise. She knows she can�t do it, but he encourages her to try. He holds her hands and she does stand on her own two feet one last time. Then collapses into his arms. She�s dead. Pinks grants her last wish the only way he can now, by carrying her up the stairs with him. Gloria dies fulfilled and happier than she�d ever been in her life. The Big Street started out as a short story by Damon Runyun called "Little Pinks", that was featured in Collier's magazine. Runyun wanted to produce a film, so he negotiated with RKO studios to have the story turned into a film. As producer, he had final saying in the casting decisions and he turned down several actresses considered for the role of Gloria Lyons, the story's heartless, gold-digging leading lady. Then one day Runyun was introduced to the studio's "Queen of the B's", Lucille Ball, and he knew he found his Gloria. He requested her for the film, and thankfully, though the studio thought he should get a "bigger name" for the lead, he was able to cast her in the part. Lucille was very excited about the film. She considered it the best role she'd been offered up to that point. Her co-star was Henry Fonda, who was on loan out to RKO from 20th Century-Fox. Shooting began on April 17, 1942, under the direction of Irving Reis, with Fonda and a slew of terrific character actors filling out the cast, including Agnes Moorehead (of Bewitched fame), who became a life-long friend of Lucille's. Seeking feedback from her good friend, actor Charles Laughton, about the role of Gloria Lyons, Lucille sent him the script. He advised her, "If you're going to play a b*tch, play it!" And "play it" she did. In my opinion, Lucille gives the best dramatic performance of her entire career in The Big Street. Just look at the scene where she is in the hospital bed, and discovers she is paralyzed. Sitting up, with music playing, she starts to move her arms and shoulders, like she's dancing. It's then that she realizes she can't move her legs. 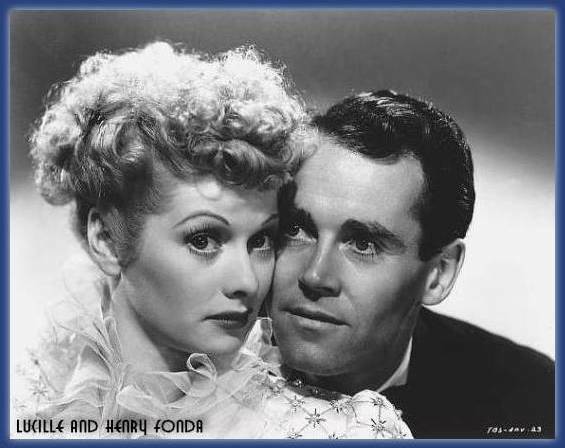 She looks up with a tortured look on her face and finds Henry Fonda standing there. It's such a moving scene, so incredibly well done. Lucille was very proud of the film, and rightly so. 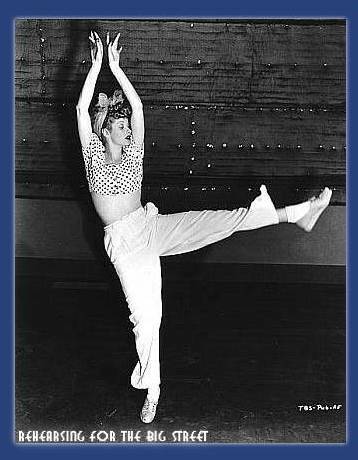 She received glowing reviews; Life magazine noted, "The girl can really act. As Runyon's tough little crippled nightclub queen, Lucille is superb." The film stands as an ultimate testament to the fact that Lucille talents were by no means limited to comedy. She was capable of displaying a level of intensity and range of emotions that made her a wonderful dramatic actress as well.